← Shopping and celebrations…..it’s not a bad life! Yet again, just when we think we’re making great strides forward, catastrophe strikes! This time in the form of a key supplier who has suddenly decided that they are not going to make garments any more (it’s too complicated and simply weaving the fabric and selling it on to other manufacturers is considerably easier to manage!) and we have several large orders due out of this particular factory over the next few weeks. Cue a great deal of heated debate about what they will and won’t do to fulfill these orders, which has eventually left us with significantly less stock than we should have had coming in! The unpredictability of life in a buying department, and the possibility of euphoria one day, followed by disaster the next is no longer shocking, simply, at times, very frustrating. To survive in this business we really have had to develop considerable resilience, and an ability to think very creatively to come up with solutions to manage such situations – it is not an environment for the faint hearted! However, this downside was, as is usual, closely followed by an upside – a buying trip to Turkey. This turned out to be a very creative week, visiting existing suppliers to negotiate prices and continue product development, but also seeking out and introducing ourselves to potential new sources. We are constantly striving, in the ever more difficult economic and retail climate, to come up with better product, at more competitive prices, on shorter lead times in order to stay in touch with our high street competition, and this means constantly reassessing our sources of supply. We made some major inroads into our negotiations for programs of product across a variety of departments, to gain economies of scale, and a price advantage. In true buyer style, we also made time in the evenings, to enjoy a more relaxed discussion with some of our suppliers over dinner – critical to the development of our key supplier partnerships, but also an enjoyable way to see a little of the city, and enjoy the nightlife! Back in the office for Monday trade meetings, and then a crack of dawn start on tuesday for a two day visit to Antwerp in search of more inspiration for AW13. Now I am generally pretty calm when flying, but climbing up the four steps to the door of a very small aeroplane at London City Airport (12 rows of seats, and propellors whirring! ), I was not feeling my most confident! After a relatively uneventful hour in the air, things took a fairly dramatic turn as, coming in to land, when just a few metres from the ground, we suddenly began climbing very steeply upwards again. It was only as we were coming in for a second attempt at landing that the pilot advised us that the first attempt had been aborted due to a flock of seagulls having taken up residence on the runway! As I said, not a job for the faint hearted! Having arri ved, we hit the shops for two days, covering every inch of the city, searching for new ideas, building on colour palettes for the season and being inspired by the quirkiness of some of the city’s retailers. 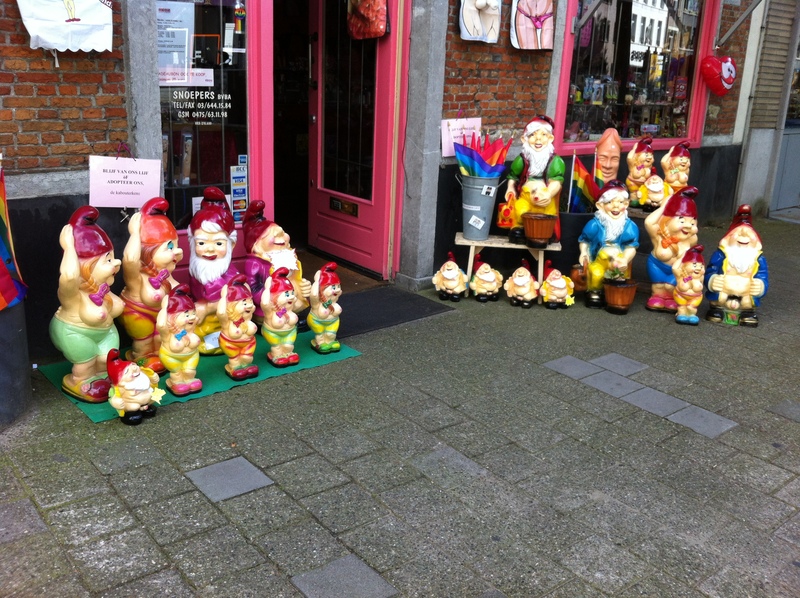 It was not without its moments of amusement – from the window full of Barbie dolls, to the “lost in translation” girls underwear, taxidermists nightmare in a children’s boutique window, and the very inappropriate gnomes – Antwerp has again proven itself to be quite unique! I was exhausted and my feet were numb, but I haven’t laughed that much in a long time! This entry was posted in Buying, Fashion, Travel and tagged Antwerp, buying, clothing, garments, Istanbul, sourcing. Bookmark the permalink.